Today’s a big day! Today I launch the Indiegogo fundraiser for my crucifix and reverse omoplata instructional and Marshal D. Carper releases his free instructional 3-D Jiu-Jitsu: An Introduction to Conceptual Thinking. Watch this video to learn why we need your help and why we’re releasing 3-D Jiu-Jitsu for free. Take a look at a page of 3D Jiu-Jitsu, like 2-05 Ankle Grip Counter. You’ll see a written introduction to the technique, like with all BJJ books. You’ll see moving pictures, a feature usually reserved for the Harry Potter universe, with each technique being shown from several angles with animated GIFs. And to complete things, you can watch a video of the technique being taught, just like in any DVD. 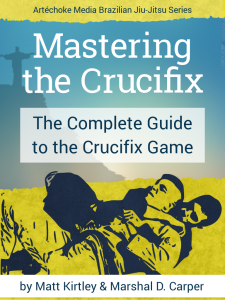 This was Marshal’s idea for a new mixed media ebook, and that’s what we plan to do for the crucifix and reverse omoplata that I love so much. We hope you like the “text + gifs + video” format and how it works across every device with an internet connection. We’ve been testing it on Macs and PCs, iPads, iPhones, Android phones, and anything else we can find with a web browser and a screen. We have more refining to do, but we hope you like the new approach as much as we do. Marshal runs a BJJ publishing start-up called Artechoke Media. The BJJ book market has slowed to a halt, and that bummed Marshal out. He has big plans, but so far he’s been testing the BJJ ebook market with Don’t Wear Your Gi to the Bar and now 3-D Jiu-Jitsu. He’d brought me in as a bona fide black belt to be his first “big” instructional. I’ve had an outline for a crucifix and reverse omoplata instructional for a long time (since that’s kinda my thing), but I was waiting for a cool way to do it instead of just making a DVD. Marshal showed me tests of his “multimedia ebook” idea and I loved it. We got started on my instructional, with him flying me out to Pittsburgh to film it. But after experiencing catastrophic camera failure and trashing everything we’d recorded, then Artechoke losing its web developer, and a drying up of funds, our projects were put on indefinite hold. Finish my crucifix and reverse omoplata instructional using the innovative mixed media format pioneered by 3-D Jiu-Jitsu. Establish the Artechoke Media studio and make it capable of producing future high quality instructionals with more BJJ black belts. I took over web development, and that’s how 3-D Jiu-Jitsu got finished. How’s This Different Than Pre-Ordering? Using crowdfunding like Indiegogo allows us to be fully transparent about where your money is going. Neither Marshal nor I are Mr. Big Bucks. We both work day jobs in addition to training and trying to get this BJJ publishing company off the ground. Your backing will be used to complete this project, and ideally carry us into making more products without the need to run another crowdfunding campaign. Plus, Indiegogo lets me do cool stuff! Instead of pulling the usual sales high pressure “buy now” B.S., I get to give out bonus perks like discounted GrapplersGuide.com 1-year memberships, copies of Kesting’s DVDs, an autographed photo of Kyra Gracie, a guest spot on Open Mat Radio, and even my entire personal BJJ book and DVD library. Take a look at the perks. Next Listen to me on Open Mat Radio!